Friday 13th October 2017: We are sorry to announce that Anna Gorbachyova is unable to sing tomorrow evening. The soprano soloist will be Eldrydd Cynan Jones. St Albans Cathedral will reverberate with the sound of cannon-fire and tolling bells when three local choirs join St Albans Symphony Orchestra for an evening of spectacular Russian music (7.30pm, Saturday 14 October). Coming together for the biennial St Cecilia Festival concert, St Albans Chamber Choir, Radlett Choral Society and Harpenden’s Hardynge Choir will perform Tchaikovsky’s popular 1812 Overture in a less-frequently-heard choral version. 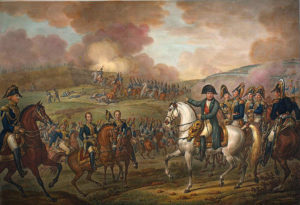 In addition to its famous artillery effects, evoking the retreat of Napoleon’s armies, the overture includes the Russian national anthem, a hymn and a folk melody that are all sung by the choir. ’The 1812’ will bring the concert to a rousing conclusion, but its centrepiece will be Rachmaninov’s large-scale choral symphony, The Bells. Premiered in 1913 and based on unsettling poetry by Edgar Allen Poe, the work depicts the sound of bells in contexts ranging from a sleigh ride and wedding to a dramatic fire and funereal mourning. Rachmaninov prized The Bells more highly than almost all his other works. Yet its characteristic flow of melodic inspiration and rich orchestration is heard in public far less often than his much-loved piano concertos. John Gibbons, regular conductor of the St Albans Chamber Choir, will be joined for the symphony by three soloists. Anna Gorbachyova (soprano) has won many awards and appeared in opera houses and concert halls across Europe and the United States since graduating from the Royal Academy Opera with distinction. Tenor Geraint Dodd has performed leading roles with Welsh National Opera, English National Opera and Opera North as well as singing with leading conductors and European orchestras. The St Albans-based bass Jeremy White enjoys an international career, appearing regularly with the Royal Opera Covent Garden and other leading opera houses, in concerts and as a soloist on numerous recordings. The St Cecilia Festival Choir and orchestra will also perform the tuneful and exotic Polovtsian Dances that Borodin wrote for his only opera Prince Igor. The music includes a ‘Gliding Dance of the Maidens’ whose melody became a 20th century ‘hit’ tune re-titled ‘Stranger in Paradise’. The concert opens with October, a tempestuous symphonic poem for orchestra that Shostakovich wrote to mark the 50th anniversary of the Soviet revolution. Tickets: £25, £20, £15 and £10 (£5 accompanied children) available from the Cathedral box office: 01727 890290 or online at www.stalbanscathedral.org.